When the Pennsylvania Turnpike opened in 1940, it was marveled as “America’s First Super Highway,” the “American Dream Highway” and the “Road to the Future.” The construction of this “Dream Highway” was the result of a successful marriage of 1940s modern engineering and construction practices and American spirit. At the time Pennsylvania, along with the rest of the country, was emerging from the depths of the great depression. The project employed 15,000 men and women who labored day and night, seven days a week to complete over 190 miles of roadway in less than 15 months. Along with the original opening of the Turnpike in 1940, and the major expansion of 1950, came the need for rest stops, the service plazas. The original service plaza buildings, single-story limestone structures with slate roofs, were quaint and small; however, they met the program at the time of the opening of the original Turnpike, which was simply to provide sit-down dining service for travelers. Since the Pennsylvania Turnpike’s original construction, the Pennsylvania Turnpike Commission (PTC) has rebuilt the entire highway at least once. The PTC currently has a program underway to expand the highway, with a goal of three lanes border to border, New Jersey to Ohio. Astonishingly, up to the conception of this project, little had been done to improve the service plaza buildings; many of which have not been renovated since they were originally constructed in the mid-1940s and early 1950s. 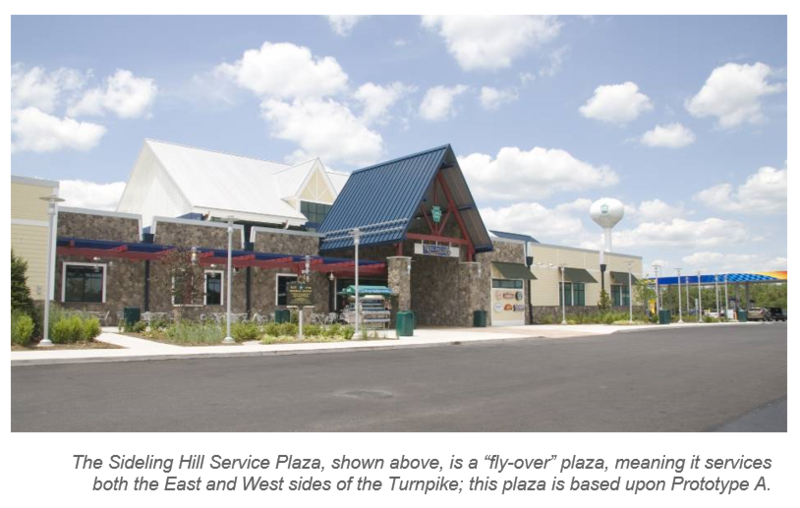 In 2006, the PTC entertained the services of HMS Host and crafted a lease agreement for HMS Host to reconstruct 17 of the service plaza buildings, and lease and operate the facilities over the next 30 years. As HMS Host is a for profit, private business enterprise, the most challenging aspect of the project was creating a design allowing construction to begin construction in late summer, just after Labor Day, and be completed during a Pennsylvania winter in order to the new facility open for operation prior to Memorial Day of the following May. The economics of the travel plaza business do not permit the facilities to be closed for construction through the summer, which is typically the prime construction period in Pennsylvania.